a. pCi/L standard for picocuries per liter of radon gas. 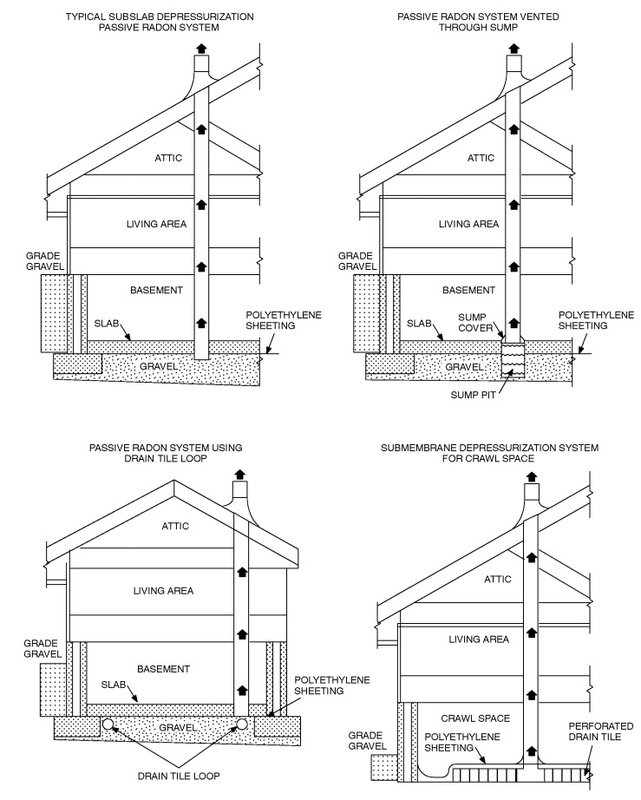 The U.S. Environmental Protection Agency (EPA) recommends that all homes that measure 4 pCi/L and greater be mitigated. 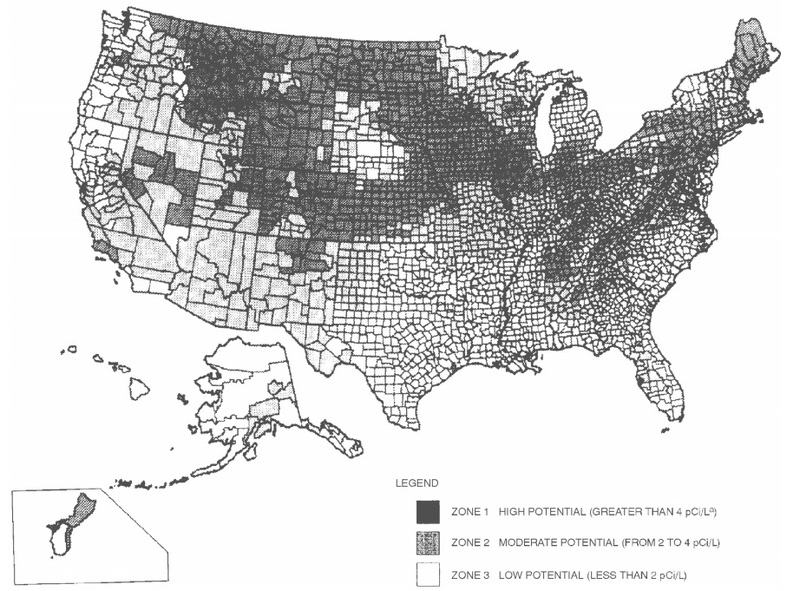 The EPA and the U.S. Geological Survey have evaluated the radon potential in the United States and have developed a map of radon zones designed to assist building officials in deciding whether radon-resistant features are applicable in new construction. Openings around bathtubs, showers, water closets, pipes, wires or other objects that penetrate concrete slabs, or other floor assemblies, shall be filled with a polyurethane caulk or equivalent sealant applied in accordance with the manufacturer’s recommendations. All control joints, isolation joints, construction joints, and any other joints in concrete slabs or between slabs and foundation walls shall be sealed with a caulk or sealant. Gaps and joints shall be cleared of loose material and filled with polyurethane caulk or other elastomeric sealant applied in accordance with the manufacturer’s recommendations. Ductwork located in crawl spaces shall have all seams and joints sealed by closure systems in accordance with Section M1601.4.1. AF103.5 Passive submembrane depressurization system. The soil in crawl spaces shall be covered with a continuous layer of minimum 6-mil (0.15 mm) polyethylene soil-gas-retarder. The ground cover shall be lapped a minimum of 12 inches (305 mm) at joints and shall extend to all foundation walls enclosing the crawl space area. A plumbing tee or other approved connection shall be inserted horizontally beneath the sheeting and connected to a 3- or 4-inch-diameter (76 or 102 mm) fitting with a vertical vent pipe installed through the sheeting. The vent pipe shall be extended up through the building floors, and terminate at least 12 inches (305 mm) above the roof in a location at least 10 feet (3048 mm) away from any window or other opening into the conditioned spaces of the building that is less than 2 feet (610 mm) below the exhaust point, and 10 feet (3048 mm) from any window or other opening in adjoining or adjacent buildings. AF103.6 Passive subslab depressurization system. A minimum 3-inch-diameter (76 mm) ABS, PVC or equivalent gas-tight pipe shall be embedded vertically into the subslab aggregate or other permeable material before the slab is cast. A “T” fitting or equivalent method shall be used to ensure that the pipe opening remains within the subslab permeable material. Alternatively, the 3-inch (76 mm) pipe shall be inserted directly into an interior perimeter drain tile loop or through a sealed sump cover where the sump is exposed to the subslab aggregate or connected to it through a drainage system. All components of the radon vent pipe system shall be installed to provide positive drainage to the ground beneath the slab or soil-gas-retarder.